THE BEST FAMILY CAMP EVER! Ok, that may be a somewhat biased title. But I am really excited that Frontier Camp will be offering a Summer Family Camp as part of our 50th anniversary summer celebration! 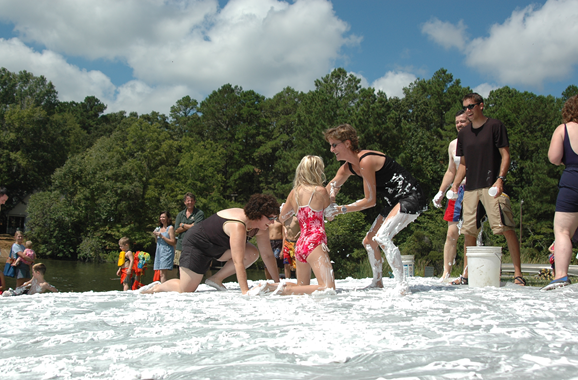 The photo above was taken during our 2004 Labor Day Family Camp…do you recognize anyone? It’s been a blast to plan a “new” but “retro” camp option. Come join us as we experience “Faith, Fun, FAMILY, and Food” together here at the Fossil Creek campus. Summer Family Camp will begin on the afternoon of Sunday August 4, 2019 and conclude mid-afternoon on Thursday August 8, 2019. It will feature all of the water sports and high adventure activities that distinguish our regular camp weeks, but you will participate as a family! All ages are welcome, but common sense dictates some age restrictions on certain activities. Campfires, s’mores, horseback riding, swimming, crafts, riflery, wakeboarding, adventure challenge (ropes), and much more await your family. During the day, you will enjoy staffed recreation, family games, and just some time to relax. At night, join in on the special FC activities, such as a hay ride, family rodeo, night games, and the “world-famous” rubber duck relay and shaving cream slide. If you have little ones who need to be indoors and resting while the rest of the family plays, we have you covered with childcare opportunities. Challenges in the Word will be designed to draw you closer to God and to one another. Time in God’s Word as a family will help you end the summer relaxed, refreshed, and recharged with some new life applications. Added to that, think of all the new recreational skills you all will have! A $50 deposit per person (excluding infants) is due at the time of registration.